The inaugural Simplyhealth Great Aberdeen Run quite literally shut down the city of Aberdeen last summer, as thousands of people took on a 10K or half marathon in aid of fundraising, fitness and fun. Thousands of runners took part, all with their own personal story to tell and even more spectators lined the streets in support. The event will return on Sunday 26 August, so this is your chance to experience first-hand what the Granite City has to offer. 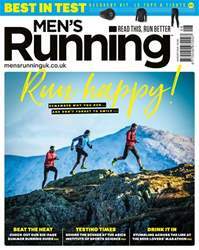 The August issue of Men’s Running is all about running happy. As a runner, it can be easy to lose track of exactly why it is you run; it’s all too easy to get swamped by target times and the pressure to perform. Our feature on Running and Happiness looks at the many reasons we lace up our trainers – and attempts to reinforce the one overriding aim we all should have: to find a greater sense of joy. Elsewhere, the weird and wonderful world of racing is exemplified by the Beer Lovers’ Marathon: 26.2 miles of booze-fuelled fun. And, in a unique take on Baz Luhrmann’s 90’s hit ‘Everybody’s Free to Wear Sunscreen’, resident ultra pro Robbie Britton has a heap of advice for would-be long-distance dons. Happy running! TIME TO CLEAN UP YOUR ACT?